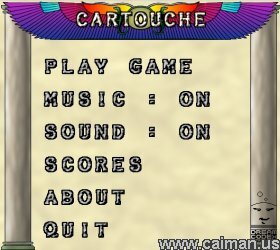 Caiman free games: Cartouche by Dream Codex. Line up 3 or more tiles of the same colour or same motif. Click on 2 tiles to swap their place. 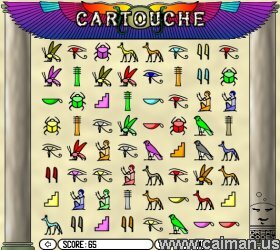 Cartouche is a variant on the popular Match-3 game category. Line up 3 or more similar tiles to produce a match, which vanishes and makes room for more matching. What's different about Cartouche is that you can match on either the hieroglyphs color or on its symbol. This adds a bit more complexity to the usual Match-3 strategy and hopefully provides a refreshing change for Match-3 fans.